Despite Seoul City’s aggressive backing, the state-sponsored Zero Pay mobile payment system has handled less than 200 million won ($177,000) a month, signaling poor performance so far, data from the Financial Supervisory Service showed Wednesday. In January, Zero Pay facilitated 8,633 transactions totaling 199 million won, according to Zero Pay tracking data provided by the FSS to Rep. Kim Jong-seok of the main opposition Liberty Korea Party. This accounts for 0.0006 percent of the 1.56 billion transactions made using credit and debit cards, and 0.0003 percent of 58.1 trillion won in total payments handled by cards, according to Kim. As there were 46,628 official Zero Pay-registered vendors as of end-January, the per-store Zero Pay transactions handled amounts to 0.19 cases per store, worth 4,278 won. The findings come amid controversy over the merits and rationale behind the state-led mobile pay solution. Initiated by the city of Seoul and Ministry of SMEs and Startups in partnership with local banks and finance companies, Zero Pay is a mobile payment system here that allows consumers to pay for goods and services by scanning a vendor’s QR code -- a two-dimensional bar code -- using a compatible app on their smartphones. It was launched in December in beta service. Currently, Zero Pay can be accessed through the mobile apps of major banks and existing mobile payment platforms like Naver Pay and Payco. When consumers scan a vendor’s code, the amount that is due is directly transferred from their bank account to that of the vendor. The scheme involves near-zero transaction fees, with aims to help small merchants save payment processing fees imposed by credit card firms and banks. To attract a customer base, Zero Pay users get a deduction in their income tax. Seoul City has been promoting the idea that a user could collect 750,000 won a year in tax benefits if that user had annual income of 50 million won and spent 25 million won using the QR pay scheme. The tax reduction is 470,000 won higher in that case than it would be by using credit cards. Despite the motives, public interest in the mobile pay system has remained weak. Doubts have also persisted over whether the pay scheme offers sufficient incentive to draw users. Critics have questioned whether the benefits of Zero Pay will make up for the costs of operating and sustaining the pay system, while arguing the government is intervening in a mobile pay market where many private players are already active. Despite persisting doubts and backlash, Seoul City has been making all-out efforts to bring more users onboard Zero Pay. Seoul City and the Ministry of SMEs and Startups said Tuesday that they are working to bring Zero Pay to Korea’s six major convenience store chains by next month: CU, GS25, E-mart24, Ministop, 7-Eleven and C-Space. Seoul City said it is also working to provide fee discounts to users who use Zero Pay at public facilities such as the Han River parks, Children’s Grand Park, World Cup Stadium and public parking lots. Zero Pay had so far been primarily brought to traditional markets and sites with a high volume of small merchants, which tend to be less popular with the younger, tech-savvy population. Improving the Zero Pay payment model is another task in the works. Right now, Zero Pay users must log into a compatible app and scan the merchant’s QR code. The payment amount must then be typed in by the consumer. 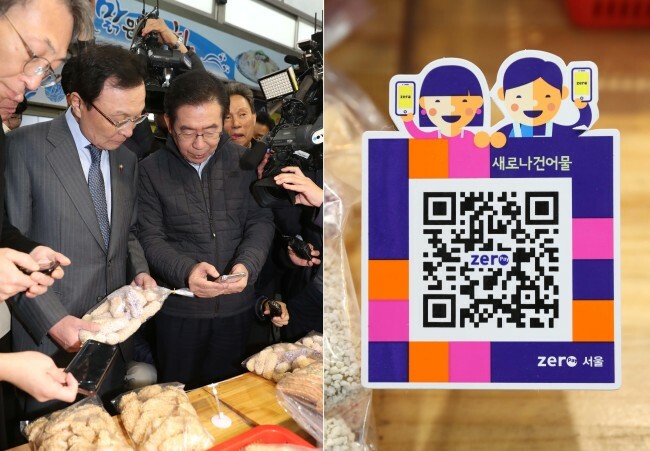 To simplify the process, Seoul City plans to roll out a new method in which consumers can pay by presenting their own QR code to a vendor, it said.